Traveling should be enjoyable and stress-free. And you deserve to be choosy about where to stay during your vacation. It should be clean, comfortable, close to attractions, and affordable. You'll find this...and so much more...at Pentwater Abbey Bed & Breakfast. 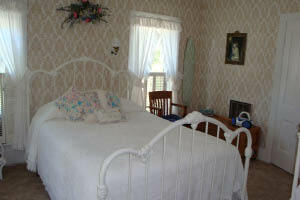 It's everything a quality bed & breakfast should be, with a warm, cozy ambiance that makes you feel at home. Pentwater's premiere inn is in the heart of this charming village and just off Lake Michigan. Pentwater Abbey has three beautiful rooms in which to choose, all with private baths. "Miss Buell's Room" is an extra large room featuring antique oak furniture, including rocking chairs. There is one queen bed and one antique twin bed. In "Aunt Emily's Room," named after Karen's great aunt, you'll sleep like a baby in the queen bed with a beautiful country quilt. You'll also find an old favorite rocking chair in which to relax. "Classic Rose" is a secluded room in the rear of the house with one queen bed. It is beautifully decorated in a rose print, reflected in the furnishings and wallpaper. 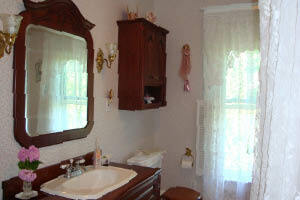 Each bathroom is quite large and offers showers and antique claw-foot bathtubs. Every guest at Pentwater Abbey is welcomed with a friendly smile, freshly baked cookies and a refreshing beverage. Each of the three rooms has air conditioning, cable TV with DVD players, radios and free Wi-Fi throughout the property. You'll appreciate the superior homemade breakfast that is served every morning at 9am in the dining room. Once your appetite is satisfied, you'll be ready to explore the nearby shops, beaches, and parks. The village of Pentwater has so much to offer! Discover one-of-a-kind items in the numerous shops, browse through an art gallery, or sit on the Village Green and watch the sailboats glide by. Outdoor enthusiasts will want to rent a bike, head to a local golf course, or head to the water for fishing, boating, and swimming. It's a small community with big activities for every member of your family! You deserve the best...where your lodging feels like a vacation within itself. 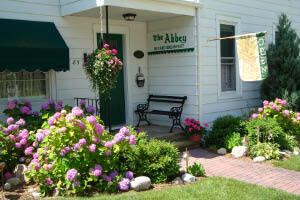 Treat yourself to a stay at the Pentwater Abbey Bed & Breakfast. They're waiting for you!